For more information about this park, contact BC Parks. New for 2019: Starting April 2, 2019, reservations will be required for all overnight stays from June 1, 2019 and year-round thereafter at Joffre Lakes Provincial Park. Camping continues to only be permitted at the Upper Joffre Lake campground. Reservations can be made up to 4 months in advance of your arrival date via our Discover Camping Reservation Service. Be prepared for winter trail conditions. Hiking poles and micro-spikes/yaktrax are required, as sections of the trail are very icy. If you’re driving to Joffre Lakes Provincial Park, please adhere to the posted speed limits through Pemberton and Mount Currie en route to the park. Speeding negatively impacts community members who live along the road and puts their safety at risk. There is also no parking permitted along the highway. Thank you for driving safely. To protect the environment and wildlife at Joffre Lakes Provincial Park, dogs and other domestic pets are prohibited. Steeply rising from Lower Joffre Lake, the glacier-laden peaks are visible from an easily accessible viewpoint 500 metres from the parking lot. If you carry on towards middle and upper Joffre Lakes, the trail becomes steeper and more challenging. Evidence of the park’s glacial history can be found in the U-shaped valleys, glacial silts and lateral moraines. This magnificent area of jagged peaks, icefields, cold rushing streams and turquoise blue lakes was established as a recreation area in 1988 and became a Class A park in 1996. No emergency services are available; visitors should be self-sufficient in this remote wilderness environment and properly equipped for self-rescue. Bring your own drinking water as potable water is not available in the park. Water from lakes or streams should be boiled for at least two minutes. Campfires are not permitted at this park. The glacial fed lakes are very cold and are not recommended for swimming. Expect winter conditions in Joffre lakes from November until the end of May. Persons travelling into Joffre Lake Provincial Park should be properly equipped and experienced in winter travel. Parking on the edges of highway 99 is not permitted. Use designated parking lot only. The parking lot fills very quickly, particularly on the weekends, and a reservation does not guarantee a parking space in the lot. Plan ahead by arriving early. There are no garbage cans in the park, please pack out what you pack in. This is a very high use park and it is busy 7 days per week, extremely busy on weekends. Camping is only allowed in the designated area at the Upper Lake. A reservation is required for any overnight stay from June 1, 2019 to year-round thereafter. Campers without a reservation will not be permitted to stay overnight. Harvesting of natural resources; this includes mushrooms. Reservations are required from June 1, 2019 and year-round thereafter. Thank you for your support! BC Parks Discover Camping Reservation System allows you to purchase a backcountry camping reservation and have a tent pad guaranteed for you before leaving home. As there is no cellular coverage in Joffre Lakes Park, reservations must be made before arriving at the park. Wildlife: Deer, black bears, grizzly bears and mountain goats reside in the area. Pikas may be spotted along the trail. Please use the metal food cache at the campsite to store your food. All climbing opportunities are mountaineering. Should only be attempted by experienced and equipped people. Only experienced and well-prepared mountaineers should attempt mountain climbing or venture onto glaciers and snow fields. The trail from the parking lot leads past three lakes; Lower, Middle and Upper Joffre Lake. Elevation gain to Upper Joffre Lake from the parking lot is approximately 400 metres. For your own safety and the preservation of the park, obey posted signs and keep to designated trails. From the parking lot, Lower Joffre Lake is just a short, five minute, easy walk and there is a nice viewpoint here. If you carry on, the trail becomes steeper, but the more challenging trek to Middle and Upper Joffre lakes is well worth the reward: a sweeping view of rugged peaks, icefields and cold, rushing streams beneath the Matier Glacier. Continuing on from Lower Joffre Lake, the trail winds upward through old growth forests of hemlock and spruce and along talus slopes. At Middle Joffre Lake, you’ll want to stop to photograph the scene in front of you: with the lake’s pristine turquoise waters fringed by sub-alpine forest and backed by rugged Coast Mountain scenery. The final stretch of the hike is narrower and rougher and brings you to the largest and perhaps most stunning of the three lakes: Upper Joffre Lake. Here you stand beneath the frozen cascade of Matier Glacier, with a fine vantage of 2,721m. (8,927ft.) Joffre Peak. In the warm afternoon sun you can hear the thunderous crashing of ice as it calves from the glacier and rockfall from the slopes above. Please keep in mind that because of the instability of glacial terrain, scrambling upslope to get a closer view is not recommended. Note on this hike: Be sure to take insect repellent, as mosquitoes and black flies can be pesky. Etiquette: Pack out what you pack in and take it home with you. There is no garbage pick-up in the park. Backcountry skiing and snowshoeing opportunities exist. Be properly equipped with, and experienced in the use of, avalanche safety gear if venturing into avalanche terrain. Coastal winter weather can change rapidly, affecting visibility and travel conditions. Be aware and prepared. The clearing of the parking lot is provided by a highway maintenance contractor and is done so periodically throughout the winter. There may be times when it is not cleared when you arrive. Please do your best to park off of the highway (shoveling may be required), and allow for clearing equipment to access the lot. Thank you, and enjoy the park. There are two pit toilets located at the parking lot and one pit toilet at the second lake. Two urine diversion toilets are located at the upper lake, one at the viewpoint and one at the camping area. Camping is permitted only within the designated campground at Upper Joffre Lake, a 5.5 km moderate to challenging hike from the parking lot. There are 26 backcountry tent pads, one urine diversion toilet, and a bear-proof food storage unit. The small gravel tent pads are located on the far (south) end of the lake and accommodate small backcountry tents. The campground fills quickly on weekends so it's best to make reservations ahead of time. Camping and reservation fees are in effect June 1, 2019 and year-round thereafter. Help keep the park pristine and practice “Leave No Trace” camping. Pack out what you pack in and take it home with you. There is no garbage pick-up in the park. Campfires are prohibited all year-round. BC Parks Discover Camping Reservation System allows you to purchase a backcountry camping reservation and have a tent pad guaranteed for you before leaving home. As there is no cellular coverage in Joffre Lakes Park, reservations are required before arriving at the park. 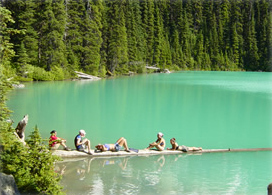 Camping is permitted year-round at Joffre Lakes Park. Be properly equipped, self-sufficient and experienced in winter travel. Caution: Winter camping at the Upper Lake campground is not recommended due to high exposure to avalanche. Choose your campsite carefully to avoid avalanche terrain. Campfires are prohibited all year-round.